First things first: Yes, the genial real-estate comedy 5 Flights Up is narrated by Morgan Freeman. At least this time, he isn’t playing a god-like, grandfatherly super-genius. Instead, Ol’ Husky Baritone stretches his range to portray a human being: a Brooklyn painter who has trouble walking up the stairs. 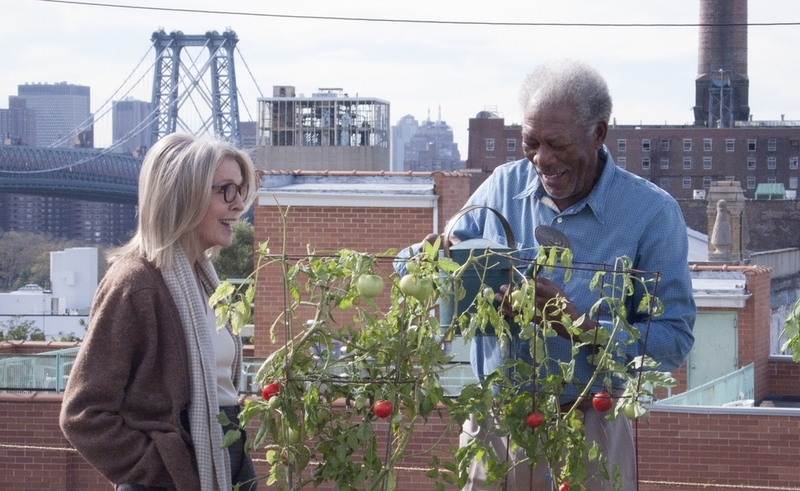 Freeman and Diane Keaton play Alex and Ruth, an elderly couple who have decided to sell the Brooklyn walk-up they’ve held onto for the past 40 years. To put their home on the market, they enlist the help of Ruth’s niece (Cynthia Nixon), an aggressive realtor who tries their patience. Meanwhile, they secretly prowl the real-estate ads for a new home—one with an elevator. It all builds to a climax where the couple paces around their apartment, swapping offers via cell phone. This doesn’t sound like much to hang a film on, and folks who prefer their subtext subtle will grow weary of the long pauses in which the film contemplates ageism, racism, gentrification, class politics, and encroaching mortality. (It’s based on a novel by Jill Ciment.) But director Richard Loncraine (Wimbledon) and screenwriter Charlie Peters are able to carry this material to some unexpected places. It helps to have two of the most effortlessly charming actors in Hollywood as leads. Loncraine takes full advantage of Keaton and Freeman’s talents, simmering his film in long takes of the two chatting and bickering… like an old married couple. Keaton, especially, seems to be having a ball. Though she’s saddled with the cutesy lines that come standard with films about elderly couples (upon viewing one of her husband’s portraits of her: “Why are you still painting this old lady?”), she imbues them with her familiar affable Diane Keaton persona, which is to say, she doesn’t take them too seriously. Ruth has lived with the guy for decades; she doesn’t have to make him believe she loves him. The movie stays afloat with its sneaky perceptiveness, dealing in how real estate’s grand mysteries alter the lives of those trying to navigate it. Alex and Ruth bought their apartment at a time when they couldn’t legally be married in half the country (charismatic young actors Korey Jackson and Claire van der Boom portray the couple in flashbacks), and held onto it for so long that it’s become a million-dollar prospect. “Who would’ve thought that the whole of my life’s work would be worth less than the room I painted it in?” Alex muses. The couple host an open house and grit their teeth as hordes of disinterested New Yorkers stomp through their carefully curated space, barking questions like, “What does this wall do?” And when they start touring open houses on their own, the same cast of hunters keeps popping up. The couple is dealing with a lot of other elements, including a sick dog and a suspected terrorist plot unfolding near their apartment. Strangely, it’s the dog, with legs that tremble violently as the vet gives her a CAT scan, that feels cheap and contrived. The bomb scare, on the other hand, opens up room for some nice dry wit: The only thing on anyone’s mind is how it will affect the housing market. The film (originally titled Alex & Ruth) gives vibes of last year’s excellent Love Is Strange, which also tracked an elderly New York couple navigating a real-estate conundrum. But it doesn’t have the same aching pathos for its characters, and it feels too guarded as a result. Part of that is the resolution, which weasels out of having Ruth and Alex confront any cold, hard truths comparable to what John Lithgow and Alfred Molina’s gay couple faced in Ira Sachs’ film. The ending of 5 Flights Up cheats the intelligence of an audience that should be prepared, by this point, for an actual decision to an honest dilemma. Nothing else to do in those final moments but watch the property value plummet.